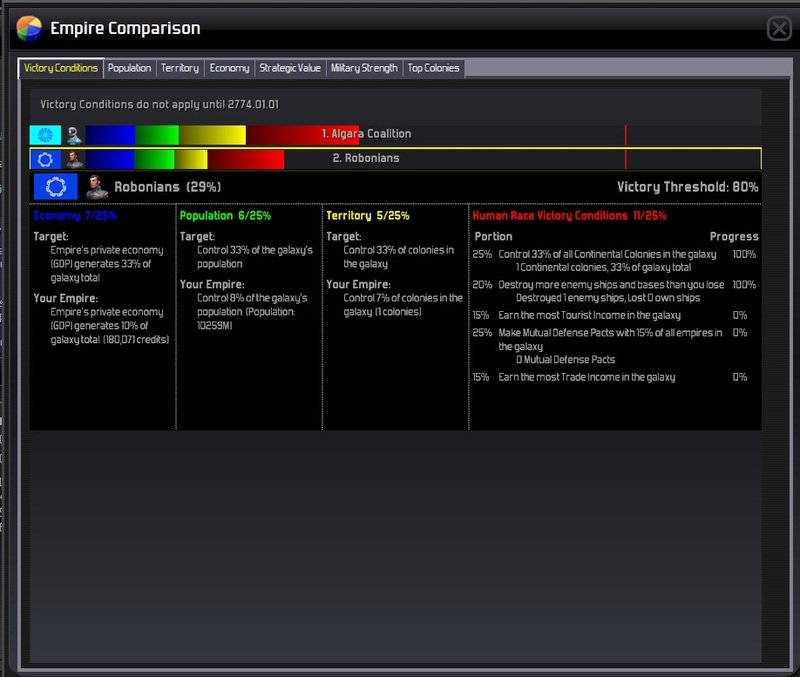 What I like: Component system for ships, character traits received are based on in-game actions, transparent diplomacy. Not So Much: Abundant resources take away from their strategic value, space too wide open - huh? Other Stuff You May Like: Huge, huge scope. Those with imagination can create their own space opera. The Verdict: While parts of the game were compelling, the game was too high level and became monotonous for me. The very thing that turns me off (the huge wide-open galaxy), will be a huge plus for others. Disclaimer: This review is based on a free review copy provided by Matrix Games. If one were to look at a feature list of Distant Worlds, they may think it is a 'typical' 4X space game in the same family as Galactic Civilization, Endless Space, or a more grounded 4X like Civilization. Distant Worlds has colonization of planets, research, space combat, diplomacy, espionage, trade and more. After I read the manual, played the tutorials and started getting my feet wet I flip flopped between a cool confidence that I understood what was going on and a panic that I bit off more than I could chew. The scope of the game is enormous - the standard galaxy has 700 stars. 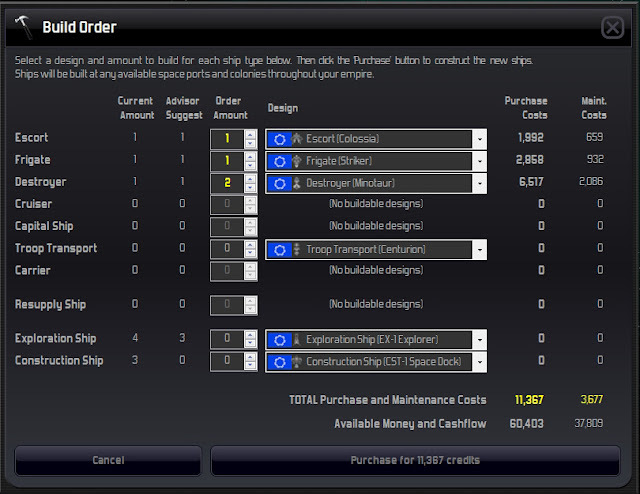 There are 16 strategic resources required to build the myriad of ship components. The goals are familiar though - grow your empire's population, expand its borders, and build a healthy economy to show your dominance over the lesser inhabitants of the galaxy. Distant Worlds is a purely single player experience. There surely isn't a shortage of volume when it comes to learning materials for Distant Worlds. The manual weighs in at 80+ pages long; there are 2 tutorials that cover the user interface fairly well, and an in-game encyclopedia. I found the manual a little too user-interface focused. The screens are explained, but I didn't feel like it delved into the mechanics in enough detail so I felt fully comfortable jumping into the game. In many places the in-game encyclopedia had text similar to the manual but did have some useful information the manual didn't. I really recommend reading the manual and doing the tutorials, and at least browsing the encyclopedia since Distant Worlds has so many moving parts. There isn't a campaign or scenarios in Distant Worlds, but there are events that tell a story of sorts. These can be turned off if you prefer a purely sandbox style of play. One area that Distant Worlds definitely excels is the amount of configuration available to the player. There are two primary areas of configuration - how the galaxy is set up and how much automation the player wishes to employ. Both areas allow a lot of customization. Distant Worlds is all about colonizing huge galaxies and then bringing the hammer down on your foes. This isn't a game where staying small is a viable way to win the game, unless you choose to disable all of the standard victory conditions. Since they are based on population, territory, and the economy you have to grow your empire to succeed. The race specific victory conditions add more variety and some flavor to the victory conditions, but they are usually only part of the equation. If you're more about the experience instead of winning, you could just disable them all I suppose and just play. I chose to start with a minimal starting position - 1 colony, a handful of ships and an entire galaxy to explore. Hundred of stars dot the galaxy and my empire is one tiny blip. I have a much easier time keeping track of my empire when I build it up from scratch, but options do exist to start from a more advanced position. 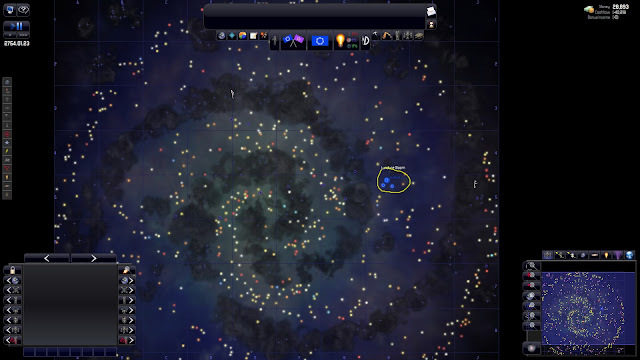 The entire galaxy - my starting colony is the yellow circle. One of my favorite aspects of 4X games is building up the economy. Games like Civilization are very hands on. 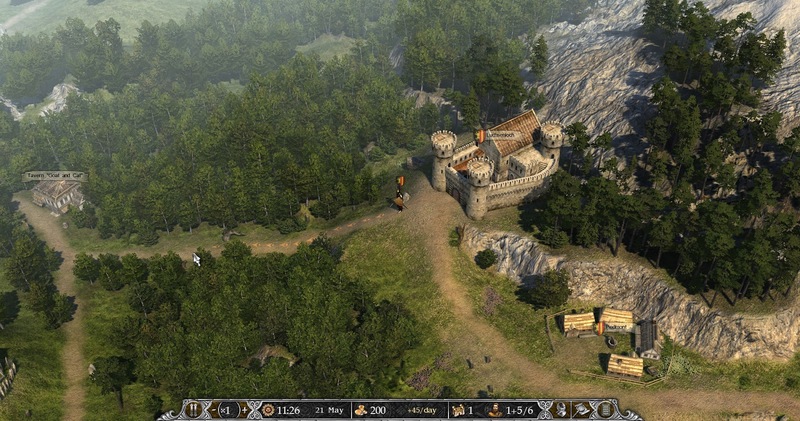 The player improves the terrain and has a large selection of improvements to build. The economy in Distant Worlds is rather abstract and hands off. There is no food to manage or workers to order about the planet surface to improve productivity. The varieties of improvements that can be built on a colony are limited compared to other 4X games. An AI controlled private economy controls mining and transporting the resources. You merely give it a nudge by building mining stations. Building my own mines was just busywork and the AI automation kept the resources flowing so I didn't even need to do that. Our tools for managing the economy are few - colonize high quality planets since they support a larger population and result in a larger tax base and try to make luxury resources available to increase the colony's development level (also increasing the tax base). Each colony can have a different tax rate to try and balance population growth and tax income, but it isn't a particularly rewarding task - especially as your empire grows. Luckily that can be automated and while maybe not quite as optimized seems like a good alternative. Resources is where Distant Worlds tries to differentiate itself from other 4Xs. Sure, games like Civilization required strategic resources to build some units, but Distant Worlds requires a large variety of resources for building anything. Ships are collections of components - weapons, engines, reactors, etc... and every component requires resources to build them. In addition, every ship requires fuel (the type of fuel required depending upon the ship's reactor). 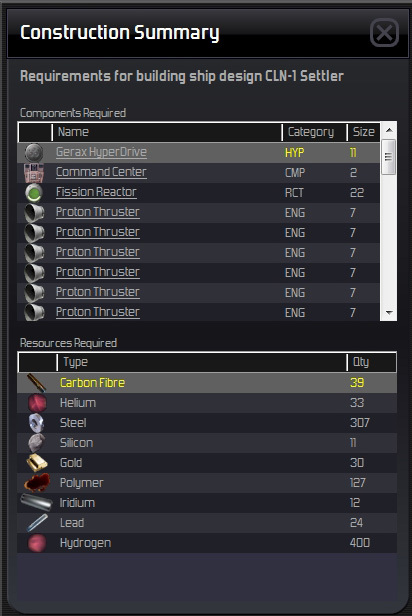 New technology makes more components available and they may require different resources than your current components. How do we get these resources? The private economy. Once our explorers uncover locations to mine resources, the private economy starts sending out ships to mine those resources and make them available on the market. We can help their efforts by building mines, but the rest is out of our control. We must still pay for these resources when it comes time to build things. It would be nice if the player could manually request some resources for a colony or port if they knew they would be using them in the future. Another interesting option to get the player involved would be to allow the player to specify the price they are willing to pay for the resources. If you pay a higher price than another empire, your shipment would get higher priority. We just have to rely on the private economy to make sure the resources will get to the projects when needed. This all works for the most part, but I didn't find it involving or interesting. While we are being critical of the economy, there is one more aspect that I don't like. With approximately 10-20% of the galaxy explored, I secured all but one strategic resource. I think Distant Worlds had the opportunity to really differentiate itself in the way it handled resources, but due to their abundance they didn't become a huge factor. If resources were more scarce, there would be a lot more reasons to go to war or find a trading partner for that resource you absolutely have to have. The makeup of the galaxy is unknown until we explore it. 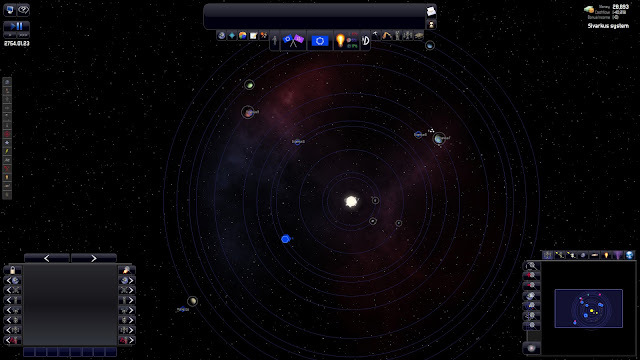 From the galaxy map we can see the number and type of stars, but we have no idea what the planets in those systems are. Certain star types are more likely to have inhabitable planets. Explorer ships can be given orders to explore individual systems, entire sectors or automate them completely. Exploration is far too tedious to control yourself except at the very beginning when you only have a couple exploration ships. 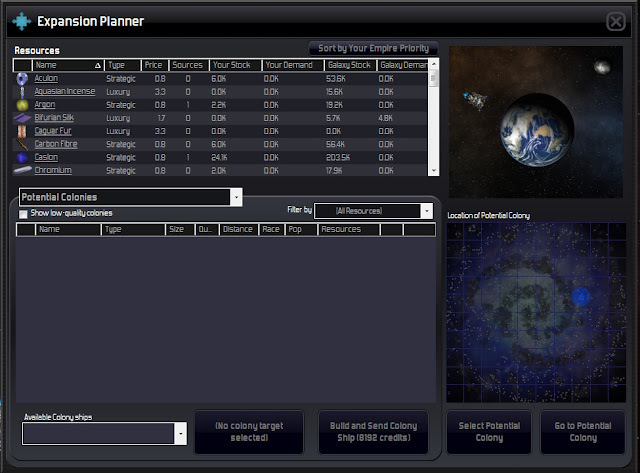 Since it unlikely that the player will look at each system as it is explored, checking the expansion planner or colonizable planet list periodically is a must. Unfortunately that just isn't as engaging as peeling back the black shroud that covers the world in Civilization. Also stumbling into the primo real estate in a game like Civ is so much more exciting than seeing that a planet has 95% quality and a couple of resources that you're not going to have trouble acquiring anyway. There are times when it helps to take a more hands-on approach with exploration, such as when searching for pirates or another empire's home world, but for the most part they can be sent on their way and forgotten about. In their travels they will uncover valuable planets to colonize, resources to mine and special locations that may boost research or have other surprises. 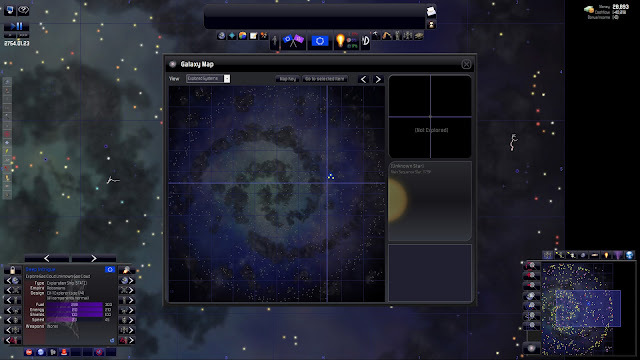 The galaxy map is an excellent tool for locating many items throughout the explored galaxy. There is a lot of exploring left to do. We've explored 3 systems! The vastness of space was too unrestricted for me. Strange, I know. I prefer the space lane approach with more restricted movement. Space lanes create bottlenecks, naturally creating tension in certain systems. That type of restricted movement goes against the entire design of Distant Worlds though. Distant Worlds strives to create a wide open galaxy, filled with possibilities. While the economy in general is boring and manually controlling exploration is tedious, I found colonization to be more interesting. Initially colonization starts off at a fairly slow pace since planets have to have a large enough population to send out colony ships. For a while this will only be your home colony (if you start off at the least developed setting like I do). At the beginning construction of colony ships is also fairly time consuming so they can't just be churned out. Several factors go into selecting which planets to colonize. A high quality planet will be most lucrative in the long run, but planets closer to your home world or existing colonies may be easier to protect. Do you want to try and grab particular colonies that are close to your expanding neighbors? Will colonizing a particular planet upset your neighbors? Should that medium quality planet with lots of resources be colonized or just mined? Should research focus on unlocking technologies that allow us to colonize more planet types? Due to these choices, I like to manually control colonization myself instead of automating it. Some planets have independent peoples already living on them. If they are peaceful and accept your colonization attempts the existing population can provide a nice boost to its development. Research is handed a little differently than other 4X games I have played. The research potential defines the maximum amount of research your empire can perform and increases more quickly in the earlier stages of an empire's growth. To actually realize that potential, your empire must build research stations. Each station produces research in one or more of the 3 fields - weapons, energy /construction, and high tech / industrial. It is best to locate these in research-friendly locations found in the galaxy to get a boost to research output. 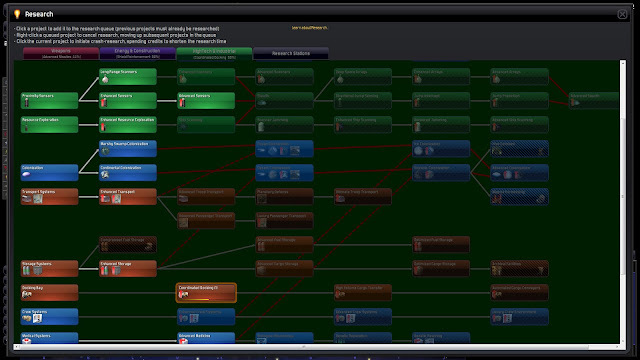 The tech trees have more independent paths than many games, which allow the player to specialize in a particular area. If your empire has a thriving economy, throw some extra money at research to reduce the time to finish the current project. Research is very tied to ship design as unlocking new techs invariably makes more ship components available. I haven't played an enormous variety of space based strategy games, but Distant Worlds has the most involved ship design that I have seen. The amount of variety in weapons goes beyond the laser, ballistic, missile model. Distant Worlds have those of course, but also have other weapons - area of effect, fighter and bomber hangars to add to larger ships, support modules that aid in shield regeneration. Weapons have different ranges, damage amounts, fire rates and more. Ship speed and turn radius also affects combat performance. I have a hard time figuring out why the ships perform as they do in combat, such as how much speed and agility actually has an effect. I don't think the variety of components will disappoint most ship designers. Long range scanners can pick up an oncoming attack, but stealth components can mitigate their effectiveness. Even use components that can prevent the enemy from warping out of combat to save their hide. 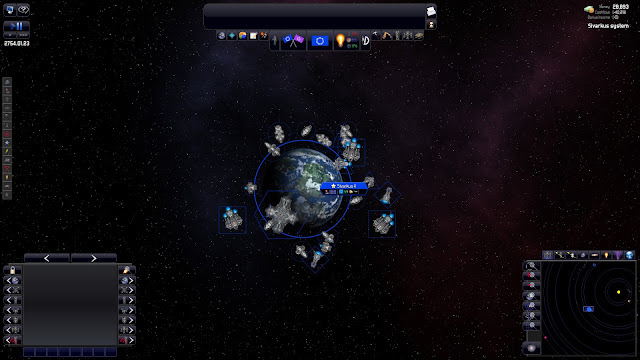 If it is overwhelming then the player can rely on AI ship designs. Individual components can be damaged in combat. The player can't target these individually, but it is nice to see a ship's performance affected instead of an ambiguous hit point number being the only indication of taking damage. The first other inhabitants of the galaxy you are likely to encounter are the pirates (if they are enabled). They have a tendency to attack lightly defended mining locations and can grow in power if left unchecked. Pirates also try making money by selling information and providing 'protection'. Have enough positive interactions with them and they may be willing to attack an enemy for you. Sometimes they can be a little too chatty with repeated offers to provide their services. I tend to want to kill them. That leads to other problems though. As pirate bases get wiped out, more will appear in other locations, leading to a galactic game of whack a mole. I found this a bit frustrating, especially with the constant alerts that I was being attacked. The build order screen is useful to queue up ships to build when you don't care where they are built. I'll join these up into a pirate hunting fleet. What is a huge galaxy if it isn't populated with other empires trying to enforce their dominance? Relations take a reasonable progression from wariness upon first contact, to a general warming if you share compatible governments. Cooperation over time can lead to trade agreements and protection pacts. If relations go sour trade embargoes may ensue or eventually war. There isn't a huge variety of diplomatic stances, but empires seem to behave in a rational manner. I have had an enemy alternate between trade embargoes and war and peace, but other than that I haven't seen any unreasonable behavior. I appreciate the transparency in diplomacy. Since I started of playing Distant Worlds with all of the available expansions I'm not always sure which features were part of the base game or added later. I believe characters were added in Legends. Governors give bonuses to the colonies they manage. Ambassadors work on improving relations with an empire. Admirals and generals improve ship and troop performance. Scientists boost research and intelligence agents perform espionage. Most of these characters are pretty generic and just result in bonuses to their respective area. The exception is espionage and is definitely the highlight of the character system. Stealing maps and research, sabotaging construction and colony development, assassinations and rebellions are all part of the arsenal. Agents are skilled in different areas, so they excel at different missions. They gain experience and improve too. Intelligence missions are transparent, like diplomacy so you know your chances of success and decide if the mission is worth the risks, because getting caught is going to provide some diplomatic fallout. Characters also grain traits based on their in-game actions. 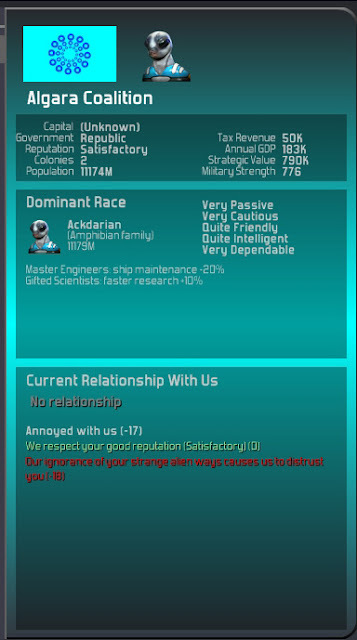 My leader gained the 'lawful' trait after I took out a pirate base. Touches like that are nice. The game responded to my actions and gave me a meaningful consequence. The amount of automation options give player the best chance at finding a configuration that works for them. Even if you automate certain aspects of the game, you can set automation parameters to help shape the AI's approach. 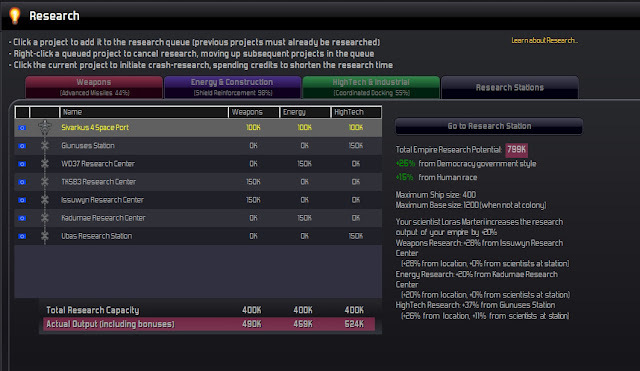 Certain aspects of the UI are quire powerful and help the player manage their vast empire - the selection box, galaxy window and expansion planner are some examples. 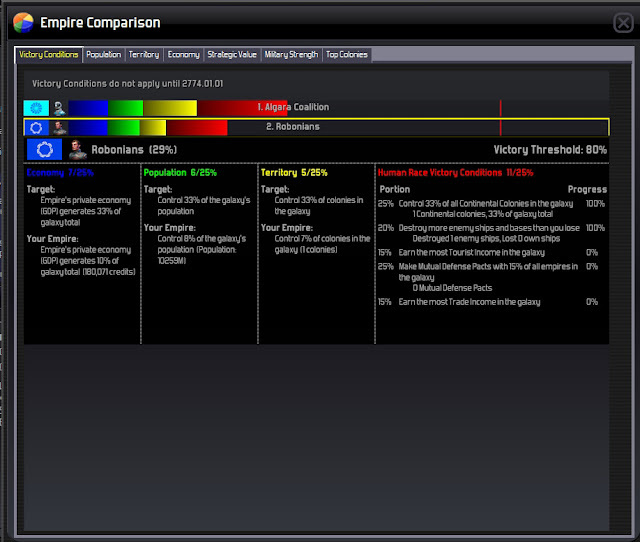 I love the graph depicting each empires progress towards victory. Many of the economic reporting tools are much too limited to be of great help. Income and expenses could use a report to show their values over time. For example, it would be nice to see how your tourism income grows as you build resorts. The same is true for resource stockpiles within your empire. Since I didn;t have any shortages this wasn't a big issue, but if resources were more scarce it would be very helpful to see if their balances were trending up or down so adjustments could be made to supply if necessary. The alert system is hit or miss. Attack warnings come a mile a minute with pirates popping up all over the place, and at times messages scroll right off the screen. There is a log to look back at, but that requires jumping to a different screen. Other events don't have any alert at all, like discovering where a pirate base is located. It would be very helpful to see a list of discovered planets and what type they are before researching the colonization techs so the player can decide if it is worth investing. Tooltips are not implemented everywhere. None of these issues makes the game unplayable, but improving the UI in some areas would surely help. The interface also doesn't scale to high resolutions. At 1920 x 1080 the resource icons and some other items are absolutely tiny. I never had a problem reading the text, but I could see how some people might. The UI falls a bit short to help the new player plan for what resources they may need. We can look at each ship and base design to see what resources they need. 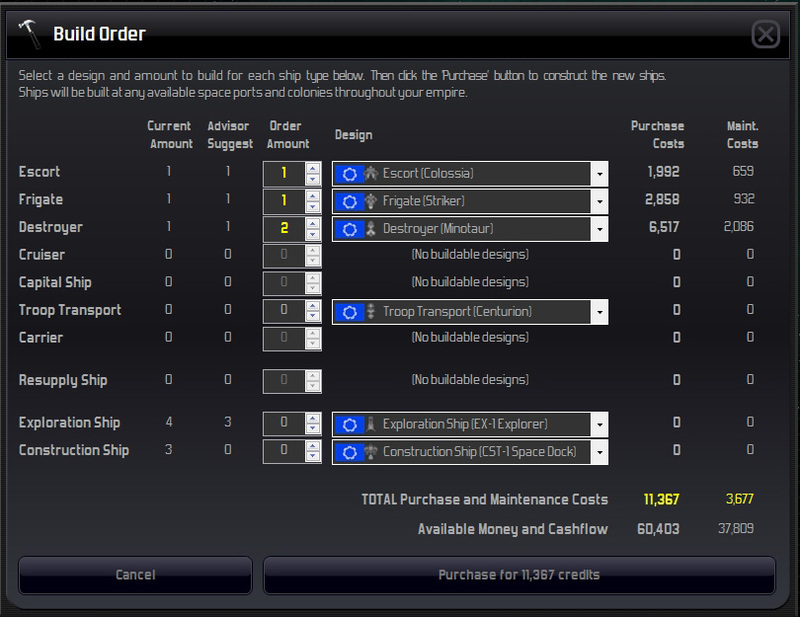 Our initial colonization ship requires 9 different resources! Does this colony ship require a lot of resources? A little? Who knows? There isn't any screen that shows the resources required to build something along with the resources available to our empire. That information is on another screen. Another option is to look at all the available components (31) and learn what resources they require. It turns out more than half of the strategic resources are used in the construction of the initial components. 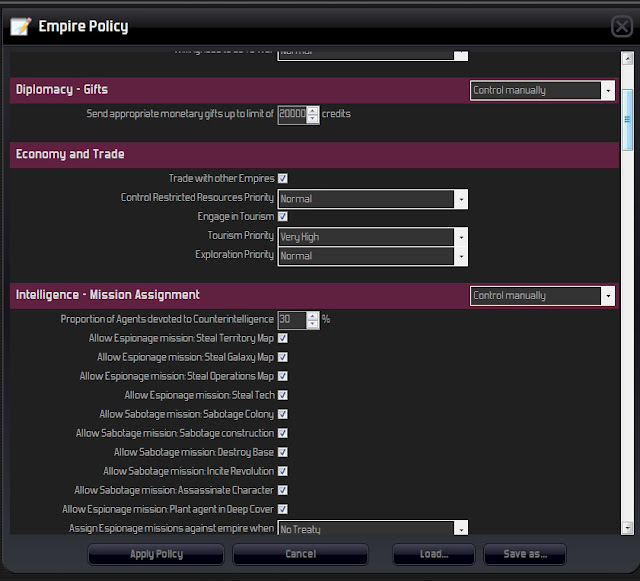 The expansion planner is a place to learn what resources are currently available to your empire and where to mine more. Other than the UI elements being too small at high resolutions, the graphics are perfectly serviceable for a strategy game. The music got on my nerves and I turned the volume way down. The combat alert sounds were a bit grating too. The game performed nearly flawlessly. I did have one crash. As the game progressed and more ships were zipping about, the game seemed to get a little more sluggish but never to the point that it was a problem. My specs: Windows 7 64-bit. Intel Core i& 860 @ 2.80 GHz. 8 Gig RAM. ATI Radeon HD 5850. I tried very hard to get into Distant Worlds but so far it has eluded me. First I put in a lot of time making sure I understood what is going on. I tried to automate as little as a could since I am a control freak and actually didn't get overwhelmed, but that was when I decided handling exploration and mining was tedious and added nothing positive to my experience. Even though the game has some cool concepts, my interest disappeared through a black hole. I have to admit I'm not a space fanatic. I have enjoyed space strategy games, but they are not my go to genre. I can see the appeal of a huge galaxy, waiting to be discovered, for those who have the space bug. Players with active imaginations, creating their own narrative to carry them along may find this giant sandbox the perfect place to host their space operas. Very few games inspire that type of treatment from me. I usually rely on the game to carry me along. I believe this is just one of those games where it either clicks with you or it doesn't, without too much in between. After reading the manual and getting my feet wet, I actually thought I was going to like this one. After a certain point, the more time I spent with it, the less engaged I became. The hands off economic system was probably the biggest drawback for me as I typically enjoy that aspect of improving my empire in 4X games. Trying to grow my colonies by acquiring luxury resources didn't give me enough to do. The huge wide expanse of space will probably be welcome by many players, but it was just too open for me. That's probably why I never have enjoyed a naval-based war game. I think those who enjoy designing their own ships will find the component system satisfying. If you don't feel like the negatives I pointed out will be a bug turnoff for you, don't be afraid to give the game a try. It seems intimidating at first, but if you can take the initial couple of steps things fall into place. Spend some time investigating ship designs and what resources they use so you gain an understanding of that relationship. Once that hurdle is cleared, the rest isn't as hard as it seems, but do read the manual! Don't be afraid to automate aspects of the game you find tedious. For me it was exploration and construction ships. While I can't say Distant Worlds gave me much entertainment, I can truly say I respect what it does. Watching a universe full of ships going about their business can be quite captivating. I really want to like Distant Worlds because of what it tries to be, but playing it sort of wears me down. It's kind of like if you're an introvert and you force yourself to be more social and go to parties. You can keep your energy level up at the beginning, but eventually your personality takes over. If you're not a 'party person' parties just make you tired. 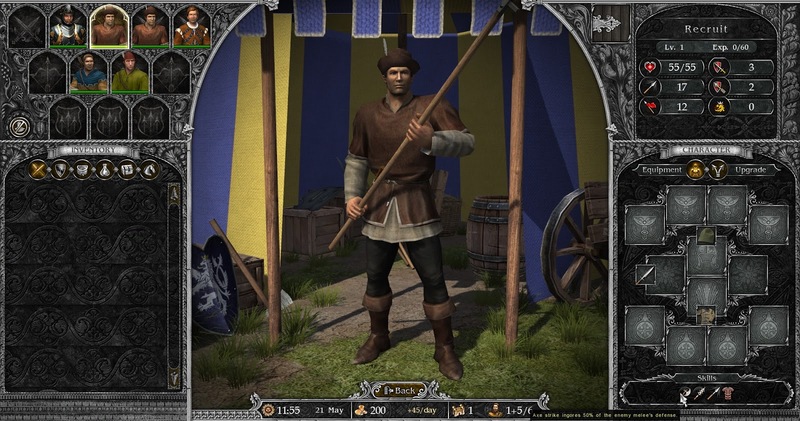 Legends of Eisenwald is a turn-based strategy / role playing from Aterdux Entertainment. I had never heard of the developer, or of their prior game, Discord Times until recently. I took Discord Times for a spin and despite its age and needing a little user interface (UI) refinement it was pretty fun. Legends of Eisenwald is the spiritual successor of Discord Times and if it can capture what made Discord Times fun while improving the UI I think Aterdux Entertainment will have another enjoyable strategy / role playing game hybrid. Remember that what follows is based on the current beta and is subject to change, along with some further refinement. Eisenwald’s game play revolves around quest driven scenarios. The beta includes 1 scenario, but the plan is to include several more single scenarios in addition to a larger campaign of multiple scenarios strung together. Based on what I have learned, it seems 50+ hours of play can be expected by playing the scenarios once. Since there are 3 character classes to play, trying them all would further extend that time. The plan is to include a map editor so hopefully some good user created scenarios will add even more content. The game’s focus is completing quests and fighting battles. There isn't much in the way of economic play – no building improvements or resources to gather. The only resource is gold which is used to hire troops and buy equipment. Note: This section has some minor spoilers for a small portion of this scenario. The player controls one character, along with his army. When I first started the scenario I was limited to 6 units under my command, but that number grew to 12. I’m not exactly sure what I did to increase this number. Since the game is still in beta, features such as tooltips and helpful messages are not fully implemented. As I stood outside my castle I received a message regarding a peasant rebellion in a small town within my lands. 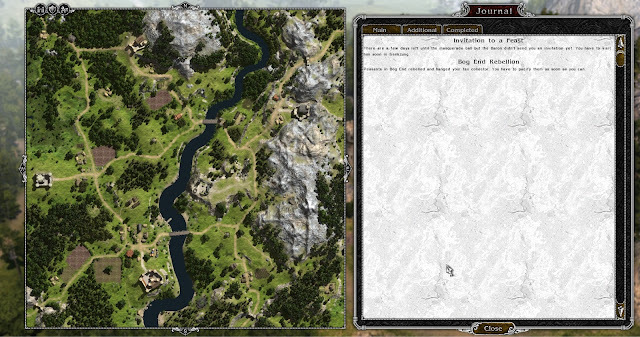 Quests are tracked in a journal which also includes a bird’s eye view of the lands (in the released product locations will have labels). We quickly headed down the road to investigate the rebellion, but were interrupted by the blast of a horn. Our castle is under attack! I decide to postpone my visit to the peasants. Since castle occupants enjoy a defensive advantage, I decide it is easier to prevent the castle from falling. Besides if my castle falls I will lose the income from it and have a harder time recruiting troops or buying weapons. I could have stationed some troops in the castle to defend it from invaders, but at this point I didn't have any to spare. As we marched I could see other armies moving along their patrols. When the player stops moving, time automatically pauses. This is a neat system. The world feels alive as each army goes about their business while you do the same, but there isn't any frantic clicking because the game pauses when you do. If the player is waiting for some event to occur, they can allow time to pass without their character taking any action. In the bit I played, my army moved more quickly than the others so I never had to chase them down for long if I wished to engage them. We waited inside the castle, preparing for the assault. After a brief fight my troops were victorious, losing only one of my archers. He quickly came to on his own, but wouldn't fight as effectively until he was properly healed. Luckily healing is available in castles so we fixed the archer right up, paying for the services in gold. If he wasn't healed future untreated injuries will eventually lead to his death. On to Bog End to deal with those peasants. The unruly lot had taken up arms and we met in battle. We quickly reduced their left flank so we could get to their archers as their attack isn't nearly as good when engaged in melee. We quickly put down the rebellion, but I can’t help but think the bloodshed would have been necessary if the attack on our castle didn't delay our approach. In fact if you do handle the peasants before the assault on the castle you get the opportunity to handle the situation with compassion or retribution. Your choices do have a material effect on how the scenario plays out. The journal isn't fully implemented in the beta, so this quest wasn't moved to ‘completed’. On to the Baron’s castle to find out why I never received an invitation to his masquerade. Our journey takes us by the Goat and Cat Tavern so we stopped by to learn of any interesting rumors. 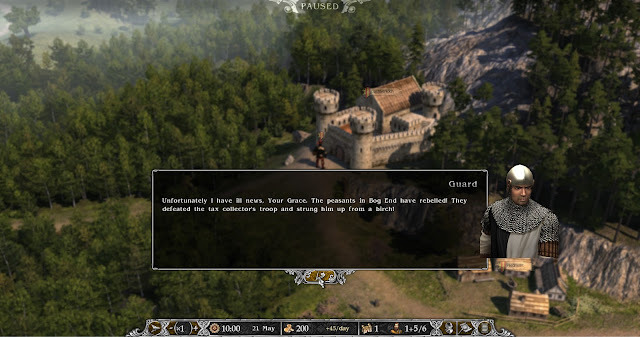 Some buildings allow various actions, such as listening to rumors, getting quests, healing, hiring troops and buying equipment. Our paths crossed with Linhart von Zongel who asked for help dealing with some bandits in an old tower. Perhaps I will give him a hand. While traveling through Zongel’s lands one of his guards tried to extract a toll for crossing though, but I refused. I wasn't sure if the guards were acting for their own benefit or that of their lord. In any case, my refusal didn't lead to violence. On the way to Baron’s castle I found a spell caster available for hire but I had as many troops as I could currently lead. I decided to station some men in my castle to make room for some improved troops. A spell caster would be helpful in battles to come. The market was also selling some healing potions, but I couldn't afford them. Your army is made up of individual people, not stacks of 100s of troops. You won’t find the typical lineup of high fantasy units. The troops are various human units, with each class having their own default weapon and armor, but their equipment can be replaced as you gain more through purchase or battle. Troop classes aren't trained to use every piece of equipment. For example, a recruit can use an ax mace, spear and light armor. Units are rated for how much damage they can sustain; attack and defense for melee, ranged, and magic; and initiative (when they take their turn in combat). As these units level up they improve their skills and can be upgraded to more advanced classes. This progression of equipment and skills lets the player have control over their army makeup and makes each soldier feel unique. 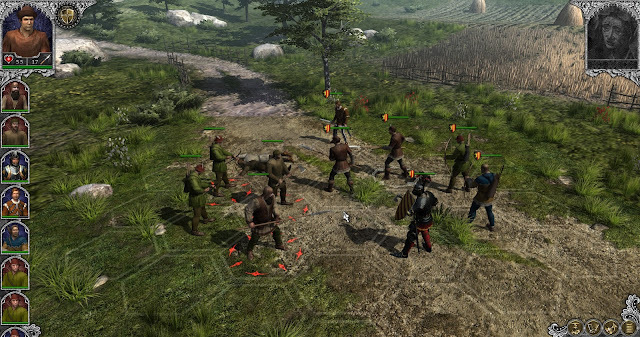 There is plenty of opportunity to make use of your army through the turn based tactical battles. Weapon differentiation if my favorite part of the system. Swords can counter attack, axes ignore some of the enemy’s armor, and pickaxes reduce the target’s armor. There are 11 types of melee weapons each with their own special bonus, 2 types of ranged weapons, and magical attacks and spells. Combat takes place on a small hex grid (7 columns with 32 hexes total). During a round. each unit takes their turn with the order based on their initiative. Units can only move and attack, or pass their turn. Passing gives that unit a bonus based on their equipment, such as units with shields get a defensive bonus. Melee units are limited to attacking their closest enemies and can’t move to a different location until the adjacent targets are dead. Luck is eliminated because there are no ‘to hit’ rolls. Every attack hits and the amount of damage is the attack – the corresponding defense. Ranged units can attack any unit on the field, but has a penalty applied to the damage if the target is more than 3 hexes away. Spell casters can target any unit with their spells. Currently ranged units and spell casters can’t move (since they don’t perform a melee attack), but the developers are working on adding a movement feature for them. The movement rules are not completely satisfying for me. While the developers have their reasons, only allowing movement if the unit actually attacks doesn't seem logical and also can prevent the player from moving a unit to try and block the enemy from reaching the weaker ranged and magical units. I would prefer a system that uses a zone of control - where a unit’s movement is stopped if they move adjacent to an enemy but otherwise have freedom of movement. Even with these movement limitations combat is still enjoyable, but it can feel like the limitations are a bit artificial. Currently the AI takes its turn in combat pretty quickly so it is hard to follow who is attacking who, but that is still being tweaked. It will also be easier to follow along after the addition of the combat log. The world and artwork are very attractive. The developers did a nice job making the game visually appealing. The music also gave me that medieval feeling. I did have some technical difficulties, but since this is in beta there is time to clear them up before release. I had some crashes when trying to load a save while playing the game (not from the main menu), and trying to enter 2 buildings consistently caused crashes (one of these were fixed in a recent patch). I didn't see a lot of people reporting crashes on the forum so I don’t know if these issues are widespread. Also, I couldn't figure out how to progress in the main quest. I’m not sure if one of the crashes were preventing me from moving forward, or if the scenario wasn't fully functional, or perhaps I’m just an idiot. As a whole I liked what I saw. Equipping units and leading them in battle is quite fun and is the main draw for me. I would prefer different movement rules, but they don’t significantly detract from my enjoyment. Not having elves, dwarfs and ogres is a nice change for this type of game and the magic aspect spices it up just enough. In Discord Times, there were some undead units, so I wouldn't be surprised if they made an appearance in Eisenwald. Probably the biggest risks are balancing the scenarios and making the quests flexible enough so the player has leeway in how the scenario is approached. Currently, at $15 for the preorder, I think the game will offer enough value and those interested in the genre should give this game a look. Heck, they even throw in Discord Times. If preorders aren't your thing, keep it on your radar for release in about a couple months. For more info you can check out their completed Kickstarter drive. If you would like the game to appear on Steam than vote to get them Greenlighted.